Summary: Fourteen kids. One superstore. A million things that go wrong. My Thoughts: This book is definitely not for those who like happy cookie cutter books. There is death, there is sexuality, there are a lot of things. 14 Kids are on the way to school one day when a major hail storm hits. One bus crushes, while another ends up being driven into a superstore. In this superstore, the kids are left to fend for themselves. Granted, they are lucky since they have all the essentials. They have basically everything they could need, since they are in a store. But all they really want are their parents, their nice comfy homes. The main character is named Dean. He and his little brother Alex are among the kids in the store. These kids range in age from age 5 to seniors in high school. All the kids set up shelter and live in the store, until people come to rescue them, at least that is the plan. We also meet a few characters who pass by and come in for sanctuary. Major things are happening outside, people are affected by which blood type they have, etc. I liked all the characters in this novel. They were so complex, each character had their own personality, and we have a lot of personalities from the jock to the nerd to the child. At first it was hard remembering who was who but after awhile, it got easier. We are taken through the novel task by task, ranging from breakfast time to inventorying the store to playing football. A lot happens in Moment 14, even though at times it seemed to get slow. 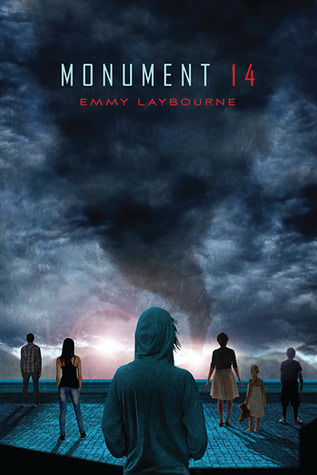 Monument 14 was an interesting novel. I can see how it won't be for everyone though. It has some pretty graphic scenes. Crude scenes. And that cliffhanger, I hope there is another book in the series! I need to know what happens next! Overall: I really enjoyed this one. I've been reading a lot of dystopias but this one was a little different. It was unique because I haven't read many where the book focuses on kids being left alone, especially in such a good environment, where they have mostly everything they could need. All in all, I thought it was a good but weird book. Cover: Like it! It definitely has that dystopian feel to it. The way the kids are just standing there, makes you wonder what the heck is happening.